Even so, it’s always a bit disappointing to discover that when you sing along with the chorus of ‘Oklahoma’ beneath your ten gallon hat and with your spurs twinkling down at your heels, that you are in fact in Arizona. Or that Casablanca’s Moorish streets and Arabian interiors are not sprinkled with Saharan sands, but with sands from the beaches and parking lots of Los Angeles. The glorious Alpine scenery of Ken Russell’s Mahler makes you want to rush to the travel agency and book a long weekend in the vertical meadows of the Dolomites, and yet the truth is that you’d be better off in a B&B in the drizzly Lake District where the film was actually made between showers. Sean Connery’s magnificent performance in ‘The Man Who Would Be King’ takes us to the farthest corners of India and Afghanistan, although both Russian and American armies might have had fewer logistic problems had they invaded Morocco, where the film crew filmed. Mind you, at least he was on the African continent, unlike Cary Grant in ‘Gunga Din’, who never left California. It isn’t often that you see cowboys in Oxford (unless you’re having some building work done) but when Harvard University refused permission to Michael Cimino to film the opening scenes of (mega-flop) ‘Heaven’s Gate’ in situ, he went to Oxford University to shoot (in the cinematic sense) his scenes instead, using Christ’s Church, the Bridge of Sighs on New College Lane and the Sheldonian Theatre among others. ‘Apocalypse Now’ was filmed in the Philippines not Vietnam, ‘Good Morning Vietnam’ should read ‘Good Morning Thailand’, but close enough I suppose. Stanley Kubrick went even further (away), filming the Vietnam scenes of Full Metal Jacket in an abandoned gasworks at Becton on the north bank of the Thames, where parts of ‘For Your Eyes Only’ and ‘Empire of the Sun’ were also filmed. The Mekong Delta scenes were filmed among the equally lush tropical foliage of the Norfolk Broads. Kubrick’s set designer was Anton Furst, who also did the sets for the first ‘Batman’ film starring Michael Keaton and filmed wholly in England at Knebworth House, Hatfield House and a power station at Acton Lane, West London and Little Barford in Bedfordshire. If Batman can be made in England; why not ‘Superman’? ‘Superman IV’ gave us the best ever Metropolis: Milton Keynes, with the railway station making a convincing United Nations building and the HQ of Argos easily imitating the ‘downtown’ hotel where Mariel Hemingway was lodged. Kubrick was a master of disguise, and nowhere more so than in ‘Eyes Wide Shut’, which was in fact filmed almost exclusively in London, either on the streets of London or in Pinewood Studios. The mansion where Cruise discovers the sect with the tedious soundtrack is Luton Hoo stately home, which has also been a location for ‘Four Weddings and a Funeral’, ‘Wilde’ and ‘Never Say Never Again’. Gladiator on the other hand never managed it as far as Italy; Malta was as Mediterranean as it got, and the opening battle scene in the wild, barbarian forests of untamed Germania were in fact were filmed in sedate Farnham, Surrey, where environmentalists were most annoyed by the swathes of forest cut down for authenticity’s sake. In the song ‘Only Living Boy in New York’ on the Simon and Garfunkel album ‘Bridge Over Troubled water’, Paul Simon sings: “Tom get your plane right on time…….fly down to Mexico”. ‘Tom’ is Art Garfunkel (the duo’s original name was Tom and Jerry) and he flew down to Mexico to film ‘Catch 22’, where the fishing village of Guayamos became North Africa for this surrealistic film about World War Two and entrepreneurial values. ‘Carry On Up the Khyber’ only rose as far as Snowdonia, whereas Amadeus’s native Austria is the Czech Republic, with impressive Vienna substituted by equally fascinating Prague. ‘All Quiet on the Western Front’ couldn’t have been much more western, being filmed exclusively in California, with all mod con trenches at Santa Ana and Balboa. The brief visits to the alien planet surface in ‘Alien 3’ involved landing at Blast Beach near Dawdon Colliery in Northumberland and at the Blyth Power Station in Bedlington. Mind you, the second part (‘Aliens’) used Acton Lane Power Station and the original (‘Alien’) was shot entirely in studios in Berkshire and Surrey. The 1938 version of ‘The Adventures of Robin Hood’ starring Errol Flynn was actually filmed in Sherwood Forest. However, it was the Sherwood Forest 15 miles west of Los Angeles, named so because the 1922 Douglas Fairbanks version was made there. London also doubles as Los Angeles in ‘Who Framed Roger Rabbit?’ where the Acme factory is in reality (if you’ll forgive the expression) an empty electrical testing station in Shepherd’s Bush, while the cinema was the Gray’s State Theatre in Grays, Essex, now closed, but which used to be the largest single screen auditorium in Europe. Rod Steiger, for me, will always be ‘Napoleon’, and Christopher Plummer is convincingly arrogant enough to play the commander who described his own men as “the scum of the earth”; the Duke of Wellington. The cockpit of Europe, Belgium, however, was jetted out to the Ukraine for the battle scenes of ‘Waterloo’, and Louis XVIII’s palace went east too and ended up near Naples. The same palace: ‘Palazzo Reale, Caserta’, was also used in ‘Star Wars Part I’ as Queen Amidala’s palace. The harrowing fighting at Omaha Beach in Spielberg’s ‘Saving Private Ryan’ was probably alleviated by a pint of Guinness or two during breaks in one of the many excellent pubs at Curracloe Beach, Balinesker, near Wexford, although the wine of the French village in the film was probably sub-standard as the French village was constructed at the British Aerospace factory in Hatfield, Herts. David Lean, director of ‘Lawrence of Arabia’, retired for 14 years after making ‘Ryan’s Daughter’. Although the film was almost entirely made in Ireland; bad weather forced them to shoot one scene, the suicide of Major Dorian on a South African Beach (Noordhoek in Cape Town), where they had to paint the black rocks white to ensure authenticity. The American film industry has made a couple of ungrateful films about their peevish rebellion; known to them as The War of Independence for some strange reason. Al Pacino’s version, ‘Revolution’ reached the heights of rudeness and ingratitude, actually being made mostly in England. King’s Lynn was Manhattan and Valley Forge was Thetford in Norfolk. Philadelphia’s elegant state buildings are in fact Melton Constable Hall in Norfolk. Makes you wonder why they ever left us! Perhaps the camera has never lied more than in Spain, where a plethora a films as meteorologically diverse as Doctor Zhivago, Robin and Marian or Lawrence of Arabia have been made in part or in full. And why not; Hemingway’s film about the Spanish Civil War, ‘For Whom the Bell Tolls’ was after all almost wholly filmed in California. 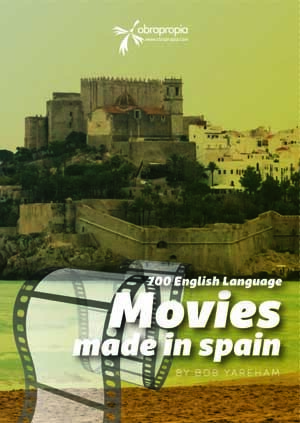 More than 700 English language films have been made in Spain since the 1920s and information about them, painstakingly researched with the help of an informal network of hundreds of local collaborators can be found in a book ‘Movies Made in Spain’ written in Valencia by Bob Yareham, after living and teaching English there for over 30 years. The book deals with Spain’s long romance with the world of the international cinema, and attempts to tell some of the stories that form part of Spain’s social history. When the mist had cleared two fierce, heavily armed armies faced each other on the green slopes of the Sierra de Urbasa in the northern province of Navarra, and yet the only exchange of fire was the local fire water known as ‘orujo’, which is just as well, as Patton’s army would almost certainly have massacred Cromwell’s, even though both consisted of largely Spanish soldiers. The incident took place in 1971 and demonstrates how popular the scenery of Spain has been for film makers over the years. The Russian steppes of Doctor Zhivago, the Middle East palaces of Lawrence of Arabia and the Ardennes forests of The Battle of the Bulge were all located in Spain, specifically Soria, Seville and Segovia respectively. The film makers’ romance with Spanish scenery and monuments reached a high point when Leon Trotsky’s nephew, American citizen and film producer Samuel Bronston, took advantage of American Big Business dollars trapped in Franco’s Spain and a Spanish army keen to get away from peeling potatoes, to make a series of epic movies such as The Fall of the Roman Empire, 55 Days at Peking and of course El Cid, although he started with the lesser known John Paul Jones, starring Robert Untouchable Stack in the story of the American Admiral who fought the British, in a film shot mostly on the Costa Blanca. When Richard Harris as Cromwell charged against the King’s men, Spain would have been nothing new to him; he had already played King Arthur there, riding out from Camelot, which in the 1967 musical was in fact the Segovian castle of Coca. Lancelot’s castle was the better known Alcázar of Segovia, scene of many films such as Orson Welles’ Mister Arkadin, The Pride and the Passion and Richard Lester’s The Three Musketeers, where Charlton Heston employs it as the Bastille to imprison a bewildered Spike Milligan. 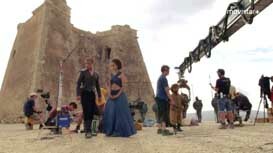 Harris would be back for more, with Spanish scenery for two Man Called Horse sequels, Robin and Marian with Sean Connery and Audrey Hepburn, where he receives a mortal blow as King Richard in front of Villalonso castle in Zamora province, and a number of westerns, while Heston would dedicate many years to making a variety of films in Spain. Spaghetti westerns are of course associated with the deserts of Almeria, where tourists can still visit western townships that have been used in so many films, and where they can watch shootouts from the comfort of the souvenir shop, although the first of these films, including Leone’s Fistful of Dollars, started shooting around Madrid, and especially in an area called Dehesa de Navalvillar, where, not only was the first Spanglish western filmed in 1958; the Sheriff of Fractured Jaw starring Robert Morley, Sid James and Kenneth More, but so was the final battle of Spartacus. With more than a thousand castles, it is not surprising that film makers should have decamped in Spain; Katherine Hepburn spent a summer in Atienza, Guadalajara making The Trojan Women, with the local castle walls filling in for Troy, while blacksmith Orlando Bloom kept the iron hot beneath the walls of Loarre Castle in Huesca during Kingdom of Heaven, because director Ridley Scott couldn’t find an authentic medieval French castle in France. More recently, Spain has offered its varied landscapes to represent Iraq (Murcia) in Matt Damon’s Green Zone, Kurdistan (Alicante) in Colin Farrell’s Triage and The Ancient Greece of the Gods (Canary Islands) in Clash of the Titans (in the original version with Laurence Olivier some scenes were shot in Málaga, in the same area where Sinatra bit the rails in Von Ryan’s Express). Sir Laurence had already met his own fate on Spanish soil at Bosworth (just outside Madrid actually) in his version of Richard III.